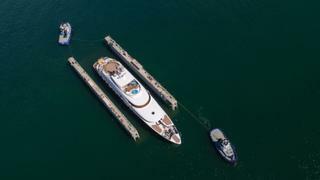 Turkish shipyard AES Yachts has released the first images of the 71 metre explorer yacht Victoria, which was launched earlier this month. 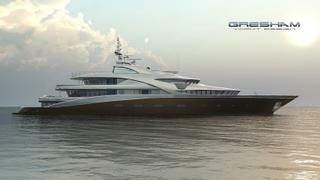 Construction began in 2006 at the Sevmash Shipyard in Russia with Gresham working in close collaboration with local naval architecture studio Agat Design Bureau. The project was eventually transferred to Italy and then on to Turkey for completion, working to Lloyd’s and MCA standards. 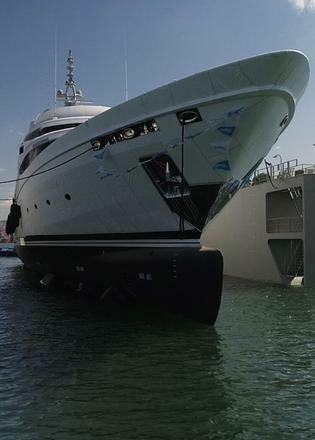 The first images from the launch suggest a white hull, but it is understood that this is a covering that will be removed to reveal a metallic grey finish, as the rendering below confirms. Gresham explained that the layout has been designed to make the most of the interior space, resulting in a total volume of 1,553GT. Key features include full-height windows by Yachtglass that can cantilever outwards, while accommodation for up to 14 guests is split across seven cabins and the crew quarters is suitable for a staff of up to 16 people. 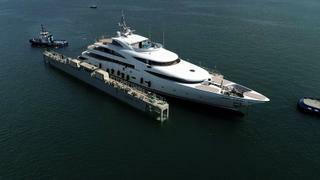 Power comes from a pair of MTU 16V4000 engines for a top speed of 18 knots and comfortable cruising at 14 knots. When trimmed back to her economic speed of 12 knots, Victoria should boast a globetrotting range of 7,000 nautical miles.